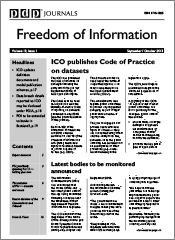 With a due tip of the hat to Mr Steven Moffat, FOI Man tackles the trend for time distorting FOI requests. The other day, one FOI Officer on Twitter reported that they had received an FOI request. Nothing unusual about that, but the requester had also asked for internal correspondence relating to the handling of the request itself. That’s right. They’d requested information that did not exist yet, and would only exist once their request had been dealt with. Earlier this week, another FOI Officer who had answered a request about procurement arrangements for a particular service received a follow-up. The Officer’s response had provided details of the current contract but explained that a new contract was in the process of being agreed. So the requester asked if the details of the new contract could be sent through when negotiations were complete. We may provide relevant information that is created or received between receipt and response of your request. But we’re certainly under no obligation to provide that information, and information that doesn’t exist yet is definitely out of scope. In both examples above, of course, there is absolutely nothing preventing the requester making a follow-up request themselves at the appropriate stage. But instead they’re attempting to put all the responsibility onto someone else – ie us. This is part of a wider, and apparently growing, impatience amongst requesters. I’ve referred previously to journalists and others quoting sections of the legislation and telling FOI Officers how to do their jobs. They appear determined to pre-empt any decision that they won’t like. But again, we haven’t made any decision yet. Then there are the numerous requests that I’ve referred to recently that we’re refusing because, quite simply, people are trying to cram all the questions they can think of into one request. They try to cover every eventuality – tortuously attempting to second guess any potential arguments we may make against disclosure. And the result is that their request is either so complex that we find it hard to work out what they actually want, or it is refused because we estimate that complying with it will exceed the ‘acceptable limit’. So let’s just make an assumption shall we? None of us have the power of time travel (damn it!) so let’s agree to work with good old fashioned linear time. You make a request. I research and answer it. You read my answer. If my answer provokes further questions, you submit another request. If you don’t like my answer, you submit a request for internal review. And so on. It’s a novel idea, but I’m hoping it’ll catch on. Major change takes time to implement! Thanks for this. Another example is where in the initial request the requester states that they’ll definitely submit an appeal if we claim any exemptions, before they have even seen how we actually respond and had chance to consider our reasons & explanation. Oh this does irritate me! It must be very frustrating for you, but a way to minimise this would be for Senior Officers to arrange to educate the local public in how to make targetted requests. I know you’re doing your bit on this site and thanks and well done to you. but what about the council homepage? 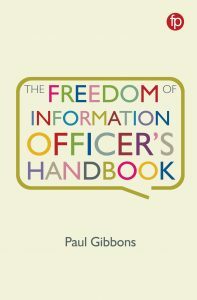 Public bodies, if they attached importance (up in the Senior Officer ranks) to this public-facing task, would either arrange to hold open days or aim to disseminate information to guide the public in how to better access their information, and thereby relieve the pressure on you. That, or stop being so guarded, do an Eric Pickles and “throw open the books” by getting it up on the website in the first place. 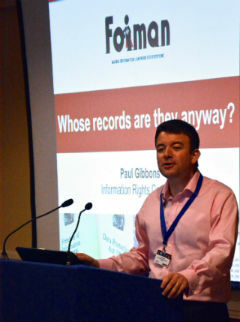 In the past I have had FOI requests treated as general enquiries so to prevent this happening again I usually begin my requests along the lines of “This is a request for information in terms of Section 1(1) of the Freedom of Information (Scotland) Act 2002/Freedom of Information Act 2000). That way there can be no mistakes and a public authority cannot mistakenly take an FOI request as a general enquiry. It seems rather pointless writing what is essentially the content of a request for review in your initial request. It wastes the requester’s time and more importantly it wastes that authority’s time as they sit and read through pages of irrelevant information. If I think there may be an exemption to be engaged I will spend extra time setting out what it is I’m looking for and why I’m looking for it. That’s far more helpful to the authority, in my view, than arguing against the exemption. While authorities are supposed to be motive and applicant blind if they understand why it is you’re looking for something the exemptions may not even play a part (that and you end up with the information you actually want rather than a whole load of irrelevant information). As for requesters that specify the exemptions I particularly love the ones that go to the trouble of doing their own public interest test. Well I love them for the five seconds it takes to register what they’ve done, discard it completely and get on with the request itself. Part of the trouble is, even when there is information available to guide the public they don’t always read it. I work for one small part of the NHS, yet despite porviding guidence that explains we aren’t the NHS as a whole (even providing links to the Department of Health’s FOI page) we still get multiple requests for information on the NHS as a whole. Not to mention requests for personal information. The trouble is it’s hard to know how many people do read the guidence. It might be preventing hundreds of requests I might otherwise have to turn down. Education is important though, so I try to be as helpful as possible, even if it’s nothing to do with us. I’d second Paul’s comment above. I work at a large organisation and we’ve been uploading frequently requested data for years. The problem is very few people bother to look at it (it is clearly marked on the site so is not difficult to locate). I know because I review the page hits for that part of the website. The result is endless repeat requests.